They say black and white photos show a sad and melancholic mood because there’s a certain level of drama that this setting provides. But this image right here is an exception to that general idea. If you think black and white photos cannot have a festive or joyful ambiance, then you are terribly mistaken. 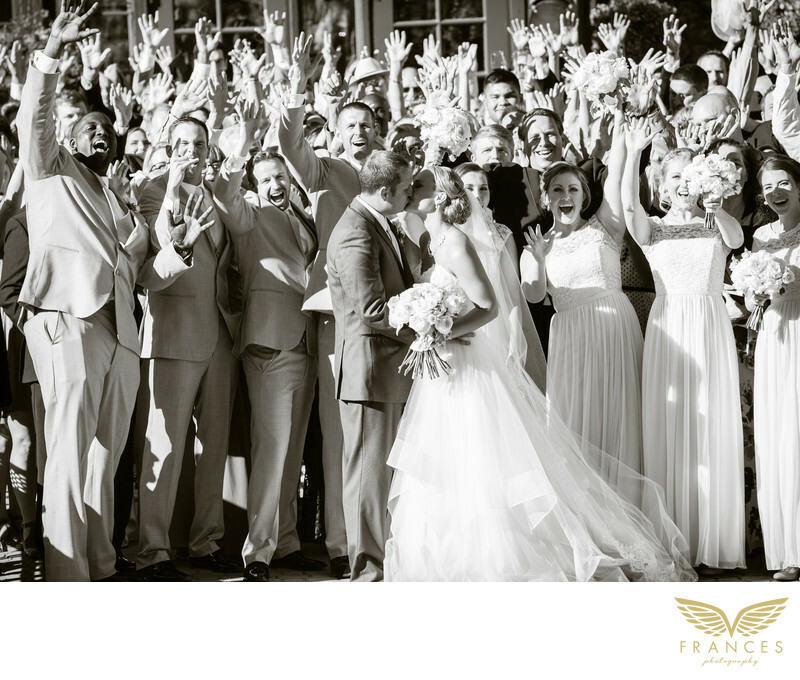 This photo right here of the bride and groom kissing in front of the crowd belies the idea that black and white images cannot show joy, happiness, or a spirit of celebration. This picture, in fact, undeniably shows one of the happiest moments during the wedding of this couple. Just look at how the guests shout and cheer for their friends who just got married. We may not hear anything from the image but with the way their mouths were opened and the manner that they raised both of their hands, you can assume that they were shouting and cheering loudly when the wedding photographer clicked the shutter. Even when the sun was shining directly on them, all of the guests did not mind the heat or the blinding ray of light. They just cooperated with the photographer to capture this wonderful picture that the couple will surely treasure. Location: BLM Rd 34 0 Breckenridge, Colorado.